Product - KODIAKOOLER. Sustainable. Foam. Reflective. Refrigerants. 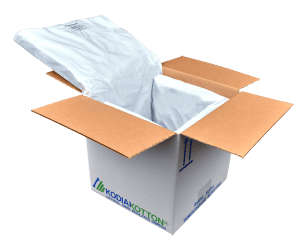 KODIAKOTTON® Natural Fiber Insulated Shippers deliver a sustainable and recyclable temperature-sensitive product packaging solution. The biodegradable insulation layer is manufactured primarily from post-industrial, pre-consumer cotton and other natural fibers. 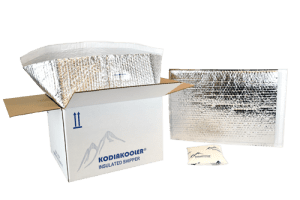 KODIAKOOLER® Foam Insulated Shippers have been the traditional packaging solution for temperature-sensitive product shipments for many years. We keep an inventory of both molded foam and wire-cut foam shippers. These stock shippers are available as foam only or pre-assembled, ready-to-pack, in outer corrugated shipping containers. KODIAKOOLER® Reflective Packaging is a low-cost alternative designed for products able to tolerate broader temperature ranges. We stock several sizes of flat pouches as well as square bottom box liners. These liners can also come along with matching outer corrugated cartons. Custom sizes are available. For packaging small quantities or using many sizes, consider roll stock for wrapping your temperature-sensitive products. Whether industry-standard packs used by many shippers or moisture-resistant packs for applications where condensation is a concern, our refrigerants reliably enhance the performance of our temperature-sensitive product packaging. We also stock Brick Ice for applications where consistent packs size is necessary to the packaging model.